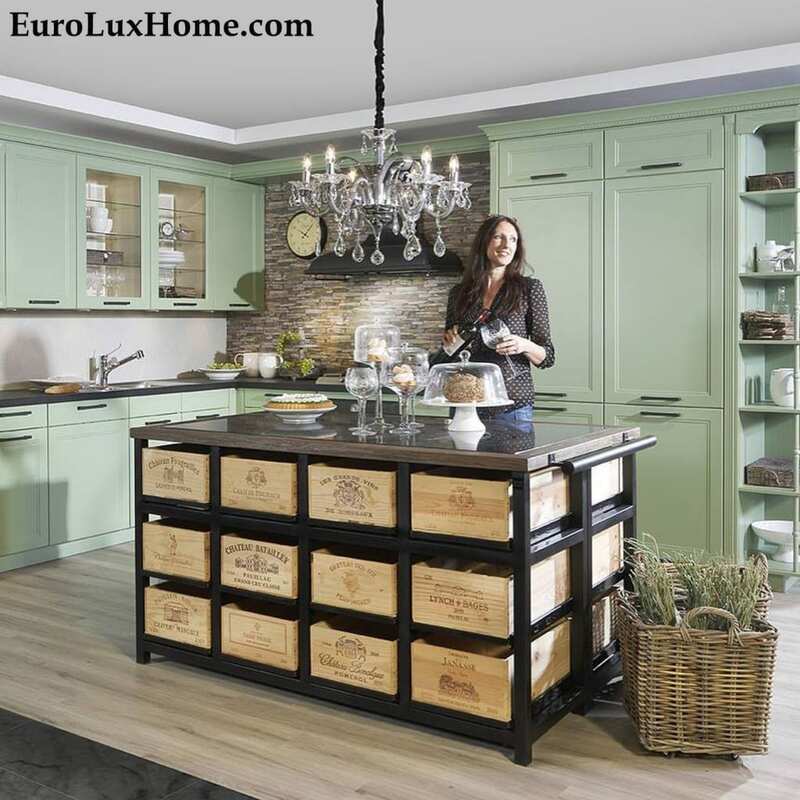 In my last post I explained that EuroLuxHome.com is now the a US distributor for Hobbs Germany Bordeaux Wine-Inspired Furniture. These pieces are very cool. 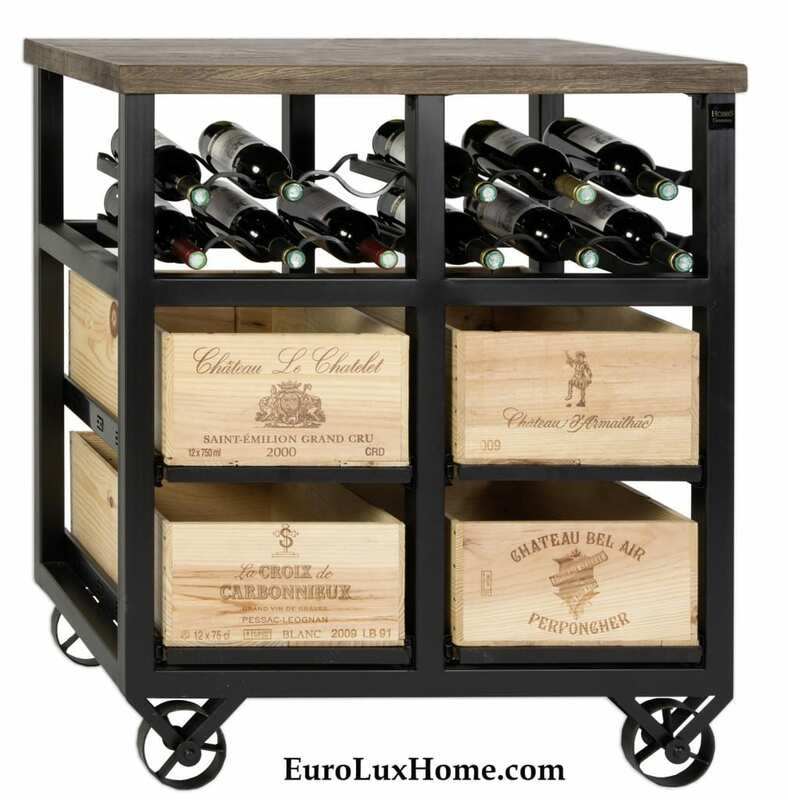 The European reclaimed oak wood furniture is very high-quality and it is unique as it features drawers made from genuine upcycled wine crates from the Bordeaux region of France. This Hobbs Germany Bordeaux Coffee Table was the #Trendy20 Best Design Nominee at the High Point Market Fall 2016. You can browse the Hobbs Germany collection on our website, and we are still adding new pieces. This was a custom order of the Hobbs Germany Bordeaux cabinets for a restaurant. 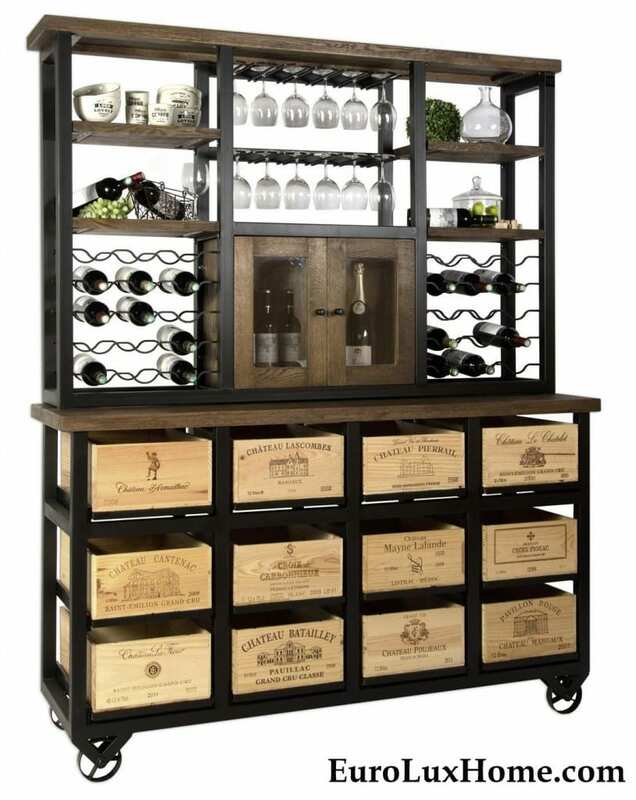 It looks amazing, and the upcycled wine crate drawers are sturdily mounted on a steel base. I explained more about the furniture construction in my previous post. This is another shot of the custom order for the restaurant. If it is strong enough to stand up to restaurant use, it certainly has the muscle to last a long time in a domestic kitchen! The designer, David Hobbs, is a British gentleman who moved to Germany in 1971 on active duty with the British military. He met Angelika, who is from Ramstein in Rheinland Pfalz. They married and decided to settle in Germany. They began importing British antiques into Germany in the 1970s and then moved into French antiques, specializing in sales to the US military community. Over time, David also began designing furniture and built his own company, Lifestyle Furniture, in 1981. However, the Bordeaux Collection, launched three years ago, has become his true love and passion. 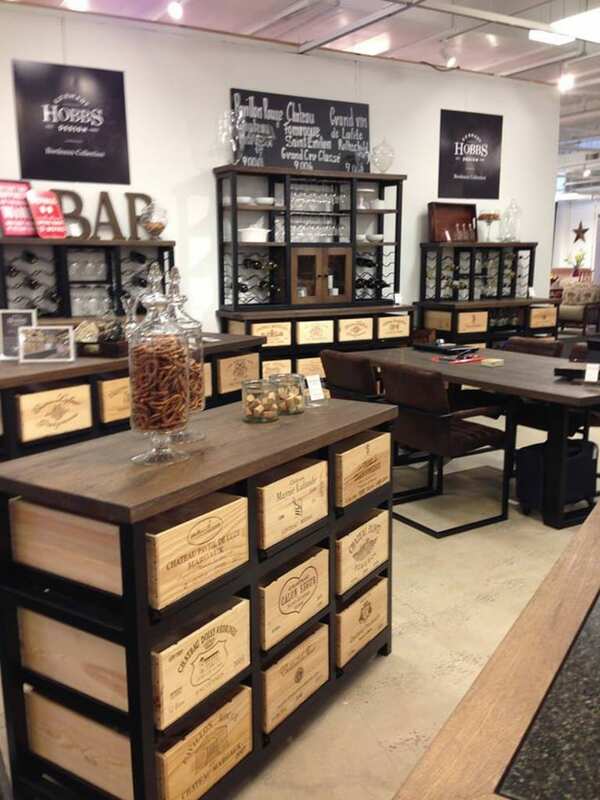 The Hobbs Germany Bordeaux Collection is currently available in seven Finke stores throughout Germany. Finke is a high-end home goods and design store. David and Angelika are actively expanding distribution throughout Europe. EuroLux Home is now a distributor for Hobbs Germany in the United States. On a personal note, David and Angelika also are animal lovers and they have just adopted two baby brother kittens. 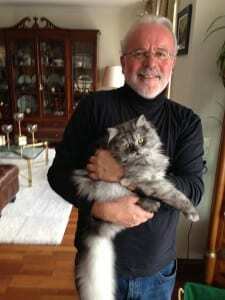 Their 16-year old Siamese, Kerri-Lee, will most likely not be happy! 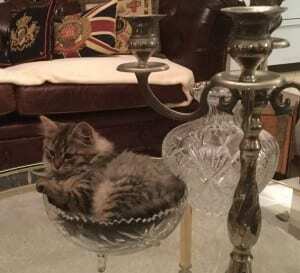 The kitten making himself at home in this photograph is Leo Hobbs. Angelika Hobbs is also a gourmet hobby cook who almost made it to the US TV show Iron Chef! 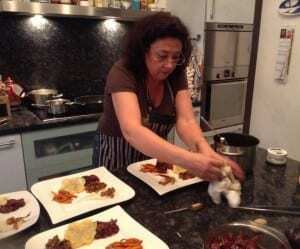 She came in 2nd place in a competition of hobby chefs in Germany, Switzerland, and Austria. Angelika says cooking is her absolute favorite thing to do! We can’t wait until we have a chance to visit David and Angelika at their home next year and enjoy a gourmet meal! Until then, we hope you enjoy browsing the new Hobbs Germany Bordeaux collection on our website. Feel free to ask any questions too… we love to talk about this gorgeous new wine-inspired line! This entry was posted in Entertaining, Home Design Ideas, News and tagged coffee table, French, Hobbs Germany, Home Bar, upcycled, upcycling, wine, wine cabinet on November 14, 2016 by admin. EuroLuxHome.com is now a US distributor for a very cool new line of furniture, Hobbs Germany! We met David and Angelika at the High Point, NC, furniture market and fell in love with these unique pieces. They were looking for a US distributor who could handle shipments from Europe and a drop-ship model of business – voila! That’s us! 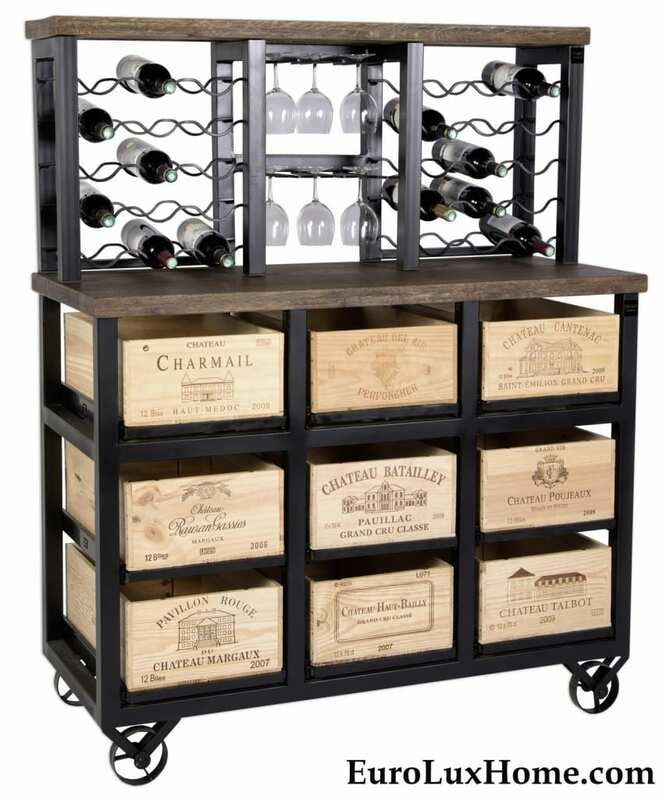 The wine-inspired furniture has a heavy-duty steel construction that is welded together for strength. The wooden tops are solid, European reclaimed oak. 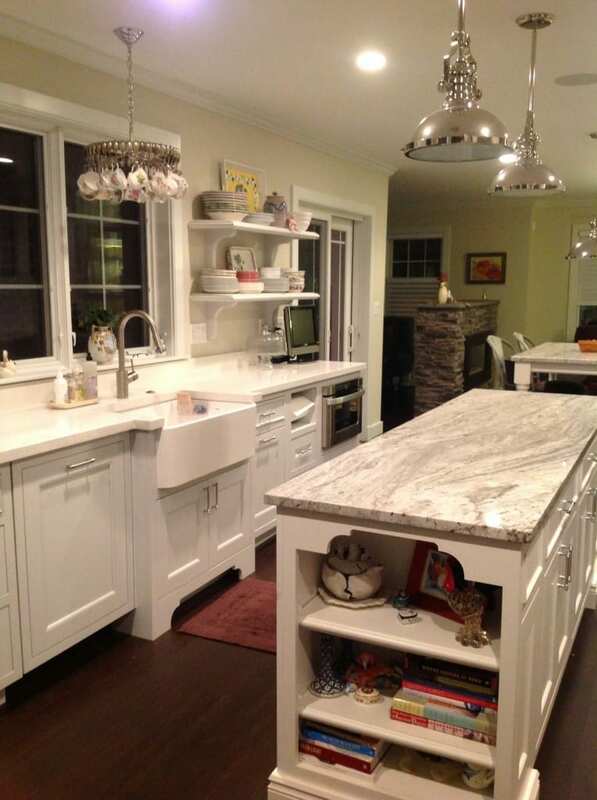 The kitchen islands have beautiful tops made of granite from Italy. 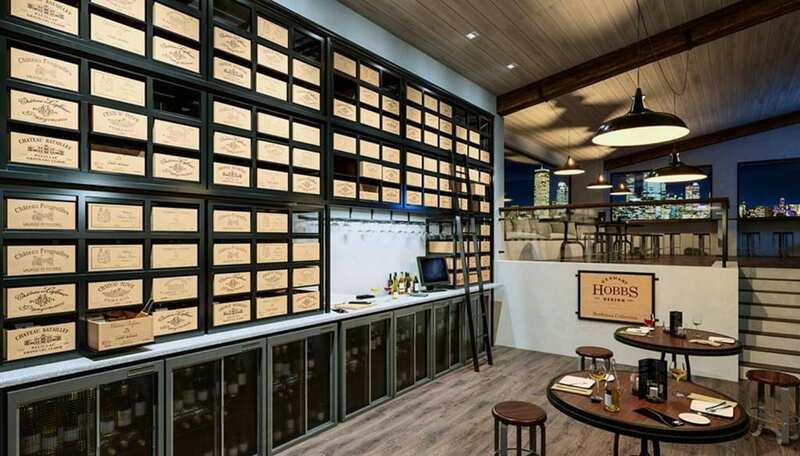 But the coolest part is that the drawers, with heavy duty slide construction, are made from upcycled wine crates from the Bordeaux region of France. The stamps of the wine houses will of course vary from piece to piece but are all authentic. These are very high quality pieces and we felt they would be a great fit with our French antiques! See the full Hobbs Germany collection here. As the wood is reclaimed (perfect for the environmentally conscious and those who love upcycling!) there is heavy distressing that is a natural part of the product and will vary from piece to piece. The solid oak tops are stained a medium brown, which can also vary from piece to piece, as the natural wood soaks in the stain at different rates. The wood is then sealed and has a wax finish that is nice and smooth to the touch. The black Italian granite slabs used in the kitchen islands have a greyish brown veining. 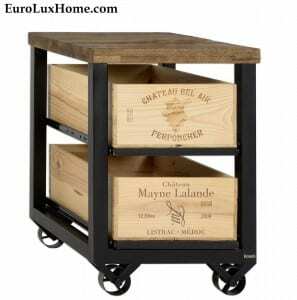 The upcycled wine crates range in age to 10 – 15 years old and are actual wine shipping crates from true vineyards in the Bordeaux region of France with the stamps of the vineyards on the crates. The crates sit on and are adhered to solid oak shelves with heavy-duty, high-quality thick metal drawer slides. The Hobbs Germany Bordeaux Coffee Table pictured above was the #Trendy20 Best Design Nominee at the High Point Market Spring 2016. In addition to the larger pieces which are wonderful for a dining room, kitchen, or home bar, the Hobbs Germany Bordeaux collection includes smaller pieces of furniture like this two-drawer lamp table. Very charming in your French-inspired decor! In my blog post on the the story behind Hobbs Germany I share more photos and tell you about the British gentleman and his German chef wife who created Hobbs Germany. Till then, we are delighted that EuroLuxHome.com is a distributor for Hobbs Germany in the United States. You can browse the full Hobbs Germany collection and wine-inspired furniture here. This entry was posted in Entertaining, Home Design Ideas, News and tagged buffet, coffee table, French, Hobbs Germany, Home Bar, kitchen, kitchen island, upcycled, upcycling, wine, wine cabinet, wine rack on November 13, 2016 by admin. We were delighted to see that Consumer Reports featured one of our chandeliers in their Kitchen Planning and Buying Guide this month. 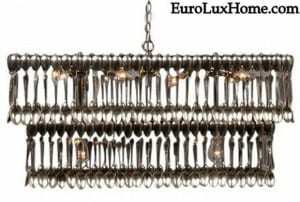 Consumer Reports contacted us a while ago about our Silver Spoon Pendant Chandelier Light Fixture, hand-made by an artisan right here in the United States. The artisan is very clever in the way he crafts up to 80 vintage silver plate spoons into each stunning upcycled chandelier. Each piece is custom made to order and, of course, each piece is unique. Consumer Reports showed a photo of the “spoondelier” in its March 2016 issue of Consumer Reports Kitchen Planning & Buying Guide. If you are a subscriber, you can see for yourself! It is part of an article on page 23 of the Buying Guide called “Get the Look” and it is an item titled Whimsical Light Fixtures. They commented on the personality of hand-crafted lights and also mentioned French collectibles, wood accents and reclaimed wood and distressed furniture in their very nice roundup. We stock a range of different upcycled vintage spoon chandeliers — or spoondeliers as some people call them. They are all hand-crafted to order. The spoondeliers are so beautiful that the Trashformers TV show featured them in one episode on FYI Networks as an example of innovative upcycled design! Read more and see a video of the Trashformers Upcycled episode here. We’re pleased that the chandeliers are getting so much media attention as we think they are wonderfully unique pieces and a very interesting take on hand-crafted and vintage lighting. If you read our blog regularly (subscribe here!) then you’ve seen some of the chandeliers in our client spotlights. They are so pretty… let me give you a little tour! Below you can see how Barbara in Cambridge, MA, displayed her teacup and spoon chandelier in her kitchen. Barbara said: “I love the chandelier and get many, many compliments on it.” See the whole post and more kitchen photos here. 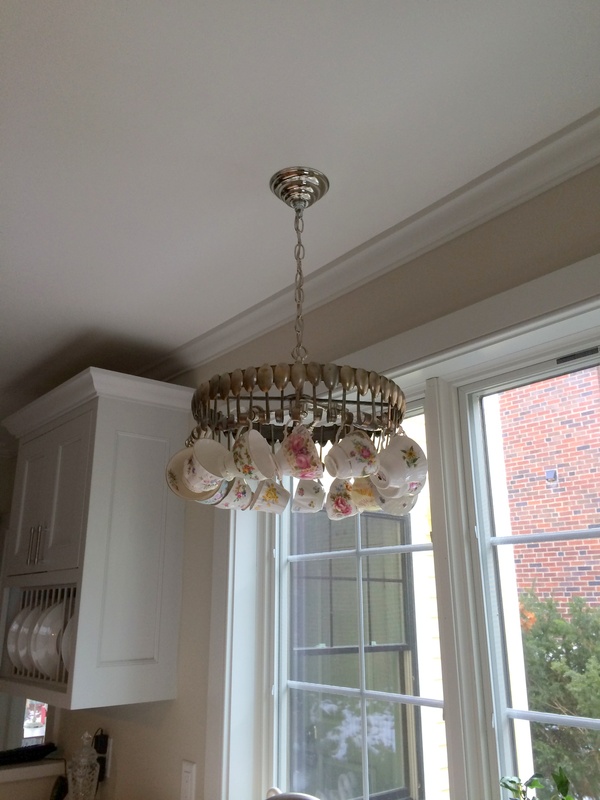 Our clever customer Kelley F. in Houston, TX, adapted her chandelier, crafted from a vintage tea service, by using coffee cups in place of the vintage teacups. Read the whole Tea Party Chandelier post with more photos. 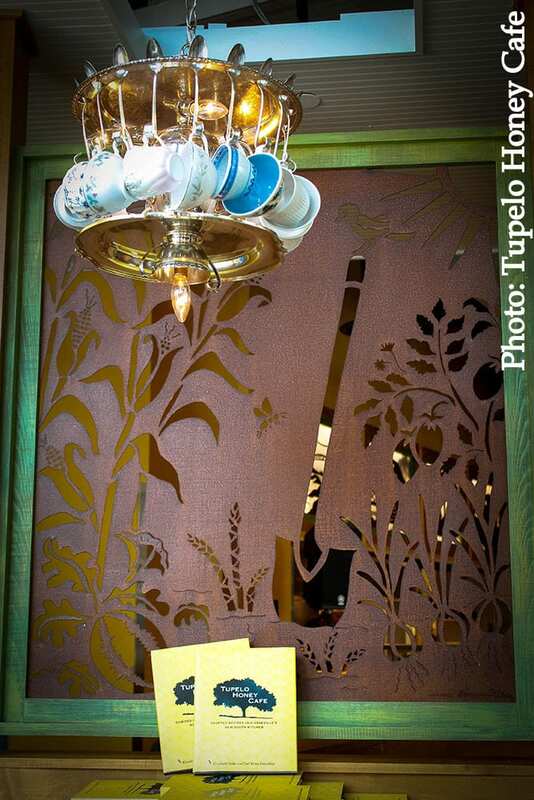 Finally, we loved how the Tupelo Honey Cafe in Downtown Greenville, SC, featured the vintage tea service chandelier in their restaurant, just in time for their grand opening. Doesn’t it look wonderful? 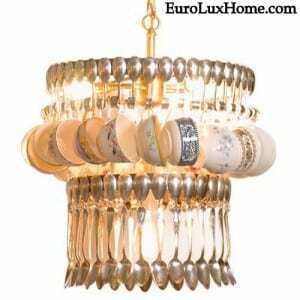 Browse all the upcycled teacup and spoon light fixtures on our website or contact us by email for more information. And then put the kettle on for tea! This entry was posted in Vintage Lighting & Chandeliers and tagged chandeliers, kitchen, lighting, repurpose, repurposing, spoondelier, tea service, upcycle, upcycled, Vintage Chandeliers, Vintage Lighting on March 22, 2016 by admin. We were thrilled when a media company emailed us to say that our upcycled chandeliers were being featured on the Trashformers TV show on FYI Networks. The spoondeliers are custom-made to order for us by a skilled artisan using vintage silver-plated spoons. This means that each chandelier is unique and you can also tailor the details and number of tiers. 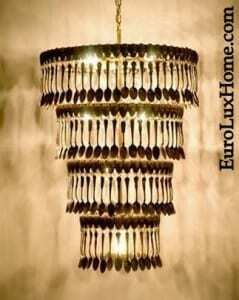 The light through the gleaming spoons creates fantastic shadows on the wall. It’s perfect in the dining room for a romantic dinner for two or for a dramatic dinner party. You can see how the upcycled chandeliers look in our clients’ homes in these spoondelier client spotlights. Some are made only from spoons, others use vintage teacups too. On Trashformers, four designers who are experts in upcycling had only three days to transform a school bus, airplane and ferris wheel into high end, high value products that people might buy. They were guided by host Brooks Atwood who advised on style and construction, and then judged by a panel of retail experts who estimated a value for the upcycled products. The team earning the highest sum of money wins the game! Here is the trailer to give you a taste of the show, which was broadcast earlier this month. Challenges included salvaging an old school bus to create new upcycled items. The transformation of an old ferris wheel into a zen-like sculpture as a cool piece of garden art is especially impressive. 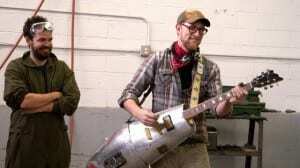 Another challenge involved turning the parts of a broken down plane into high-end products including bags, lamps, and even a guitar. Some people are so creative and that’s why we love stocking the upcycled chandeliers from our artisan friends! Do you enjoy upcycled decor in your home? Tell us about it in the comments. This entry was posted in News, Vintage Lighting & Chandeliers and tagged chandeliers, creative home decorating, lighting, repurpose, repurposing, spoondelier, tea service, upcycle, upcycled, Vintage Chandeliers, Vintage Lighting on July 22, 2015 by admin. 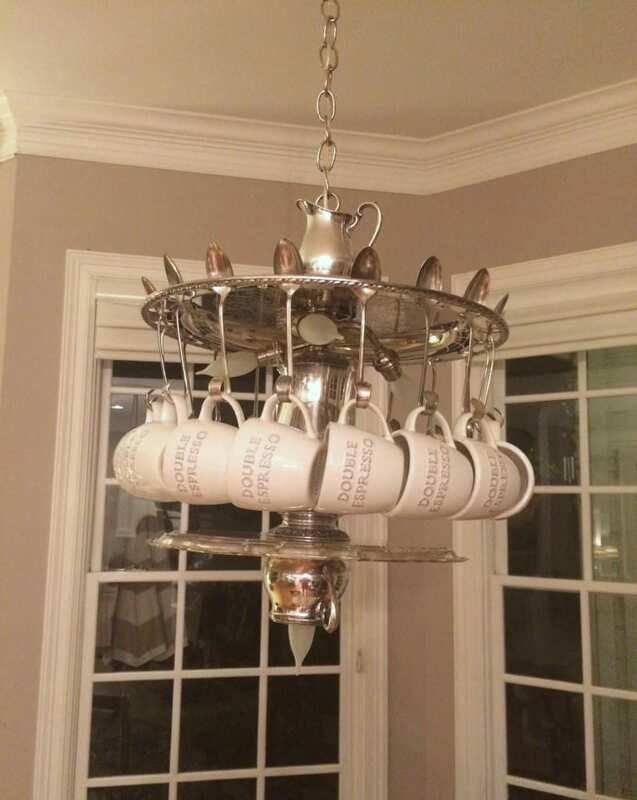 I’ve shared photos before of upcycled vintage teacup and spoon chandeliers in our clients’ homes, but in today’s client spotlight the tea party chandelier takes a new twist! This is the tea party chandelier that we have in our gallery, custom-made by American artisans. It’s crafted from a vintage tea service including the teapot itself plus the silver plated spoons, a sugar bowl, creamer, tea tray and china teacups. The whole whimsical concoction is made to order and as the vintage tea service pieces are all unique, every single one of the brilliantly upcycled chandeliers is unique too. Our clever customer Kelley F. in Houston, TX, made hers even more unique! Spot the difference? Kelley added her own personal touch by changing out the vintage tea cups to large double espresso coffee cups. 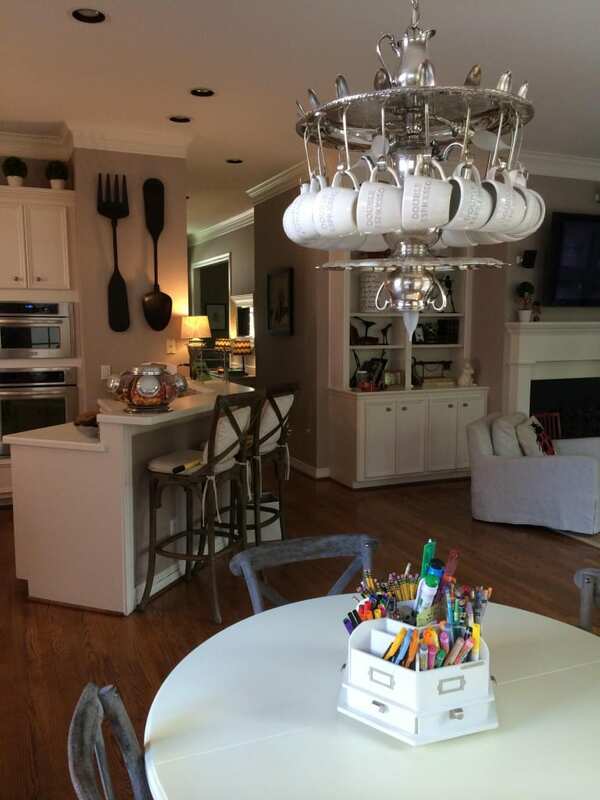 Kelley sent us the photo saying “I added my own cups to the light fixture…I’m in love!! !” She got the classic white Rhodes coffee cups from Pottery Barn, adding that she really wanted the ones that said ‘tea’ on them, but they would have been too big for the chandelier. In any case, she loves them now! Here’s another photo of the vintage tea service chandelier with the tea party transformed into a celebration of coffee! The chandelier is a substantial 23 inches high so it can hold its own as a focal point in a large space like Kelley’s open plan living room and breakfast nook. You can tell that Kelley has a very artistic eye from the interesting array of decorative items on the shelves and also the gallery of framed images on the far wall. Hmm, was that a deliberate pun, Kelley? That the tea party chandelier suits you to a T? Ha! Thank you for sharing your photos and we hope that you party on whether you choose tea or coffee for breakfast! If you like the tea party chandelier, then you might also like to see my blog posts on the Vintage Teacup Chandelier in France or the Teacup and Spoon Chandelier in a Cambridge kitchen, or the Upcycled Chandelier Decorating a New Restaurant. This entry was posted in Client Spotlight, Vintage Lighting & Chandeliers and tagged breakfast nook, chandeliers, Eclectic, kitchen, lighting, repurpose, repurposing, spoondelier, tea service, upcycle, upcycled, Vintage Chandeliers, Vintage Lighting on May 27, 2015 by admin. 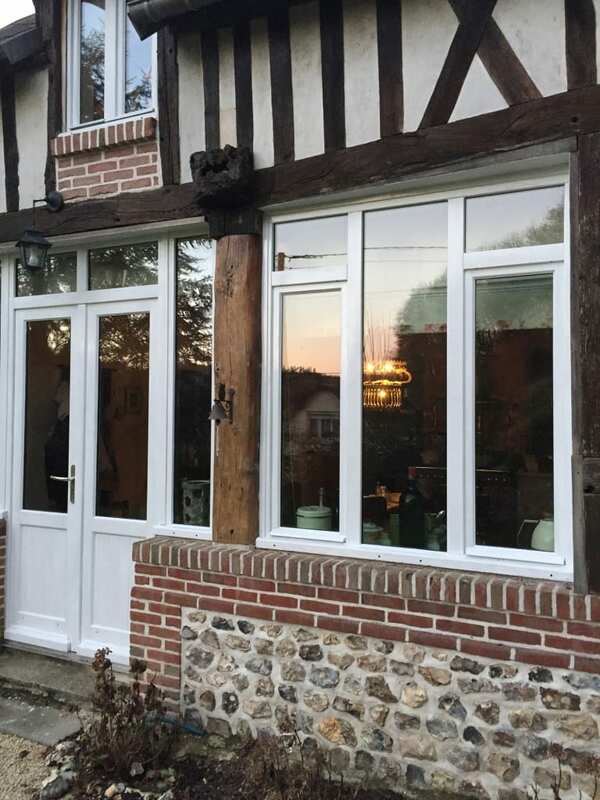 Check out how great these photos are from our customer Marie-Louise in Haute-Normandie, France! 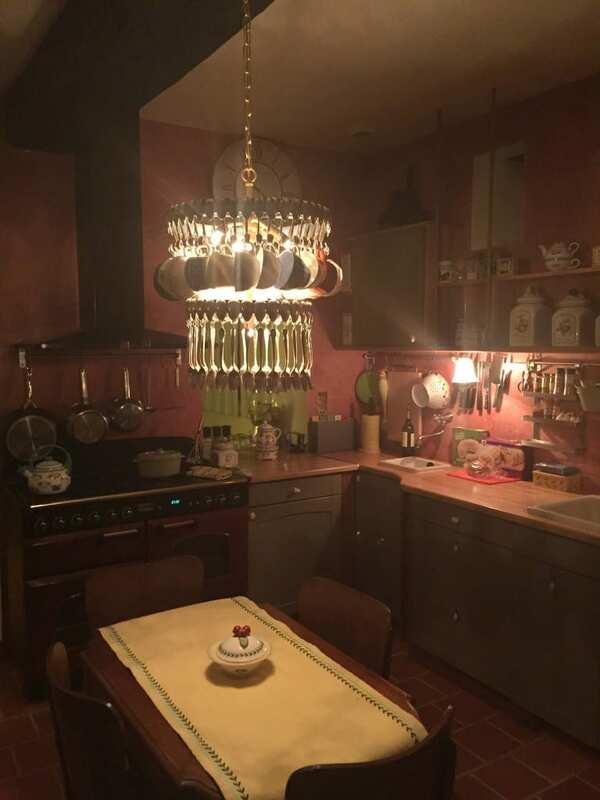 Marie-Louise bought a vintage teacup and spoon chandelier from us, and now the pretty chandelier graces her kitchen far across the Atlantic ocean. 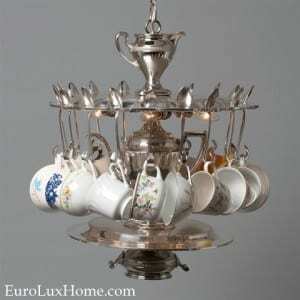 This is the teacup and silver spoon chandelier Marie-Louise chose from our selection of upcycled chandeliers. It’s hand-crafted for us by an artisan using vintage silver plate spoons for each unique creation. The whimsical teacup chandelier is literally unique as every piece is custom-made using vintage pieces, so each chandelier is slightly different. People can customize the chandelier further if they want to. For example, by opting for just one tier rather than two. The chandelier is very well traveled. Instead of shipping it directly to France as the duties are quite high, Marie-Louise opted to ship to her second home in Dubai and carry the chandelier back to France on the plane. We think it was worth the effort! 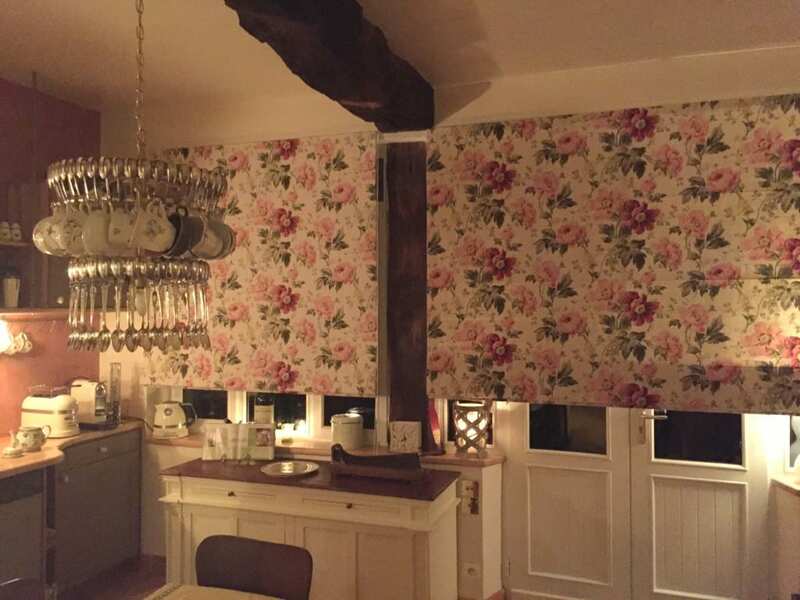 The vintage floral designs on the teacups look delightful against Marie-Louise’s rose-strewn window blinds. The teacup and spoon chandelier (or spoondelier as some people call it!) looks wonderful lit up at night. It has a sculptural effect with every cup and spoon outlined by the light. This shows a little more of the evening sparkle as the light glints off the vintage silver plate spoons. 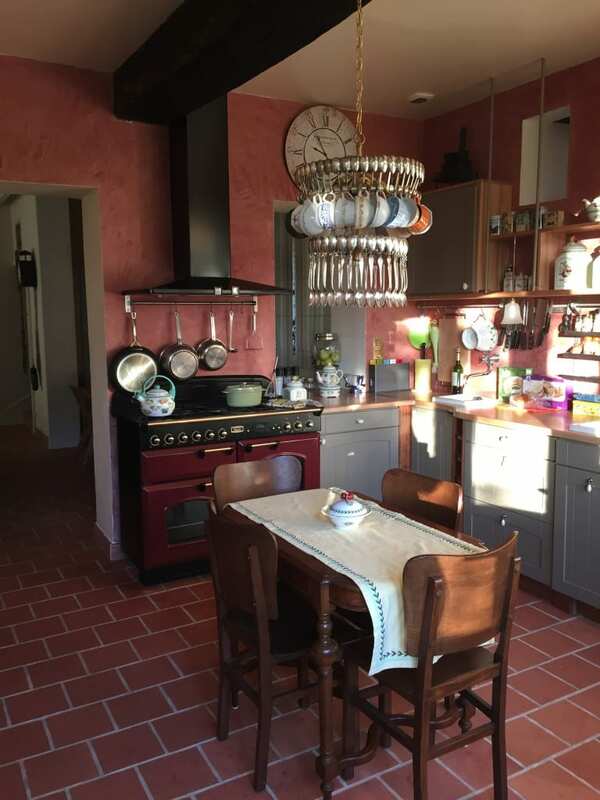 I love that she included the photo of the outside looking in to the kitchen as I couldn’t help wondering how charming the outside must be with such a gorgeous vintage kitchen. Marilou invited us to stop in on our next trip to France – we just might take her up on the gracious offer! 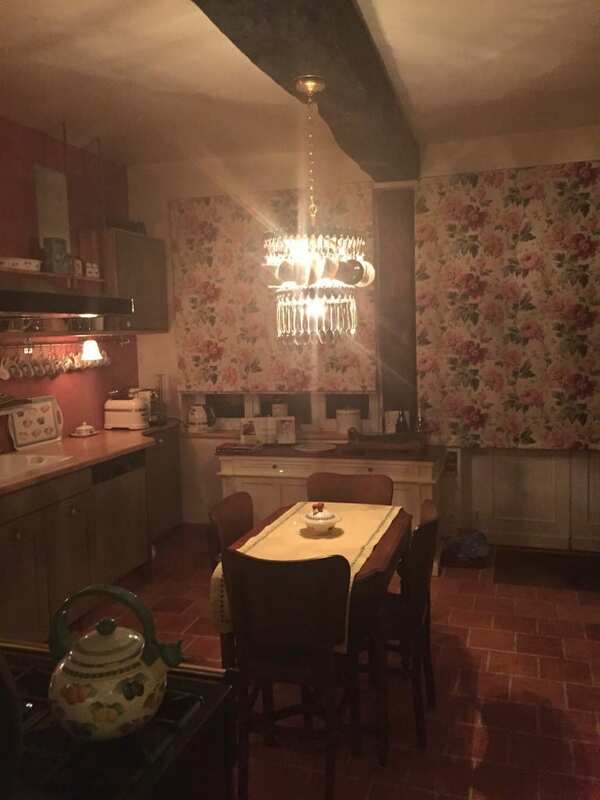 Marie-Louise is not the only customer who has kindly shared photos of the chandelier in her home. 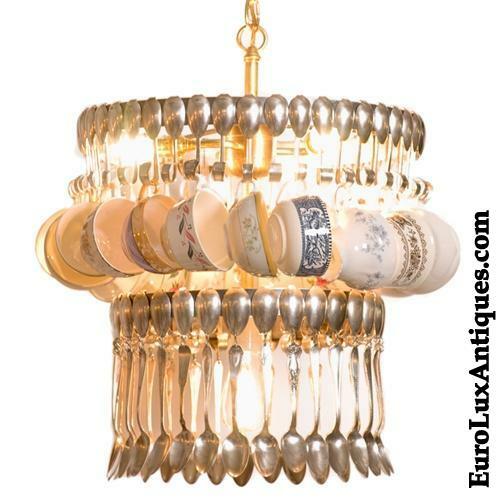 There is something about the teacup chandelier that makes everyone want to show it off! Here are some other client spotlights showing custom-made teacup and spoon chandeliers. This entry was posted in Client Spotlight, Vintage Lighting & Chandeliers and tagged chandeliers, kitchen, lighting, repurpose, repurposing, spoondelier, tea service, upcycle, upcycled, Vintage Chandeliers, Vintage Lighting on February 4, 2015 by admin. I was reading an Elle Decor article called ‘Why You Should Decorate With Copper this Year.’ The article was actually written at the end of December 2013, but as copper has stayed popular for centuries, I don’t think it will fall out of fashion favor too fast! The article urges readers to “Try a new metallic this season… It’s a perfect way to add some winter warmth to a festive home.” That is true, although copper looks rich and welcoming all year, thanks to the beautiful color and reflective glow. It got me thinking about the many ways to enjoy copper accents in your décor. Copper is so versatile, it can look traditional, modern, or exotic. It can appear perfectly at home in an ultra-glamorous urban setting or in a rustic Farmhouse kitchen. Copper always looks great in traditional room designs, especially if you have an old piece that has developed a patina on the surface of the copper. For example, this vintage French coal scuttle with a blue and white Delft handle. The lions’ heads on the handles add to the charm of this nice piece, and it would make an attractive planter if you don’t want to display it by a fireplace. In old European pubs you often see copper plates, jugs, and pitchers displayed on the walls. 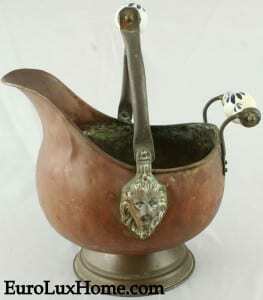 Decorative copperware is especially traditional in English and Welsh taverns. The vintage copper plate below conjures up the jovial atmosphere perfectly! 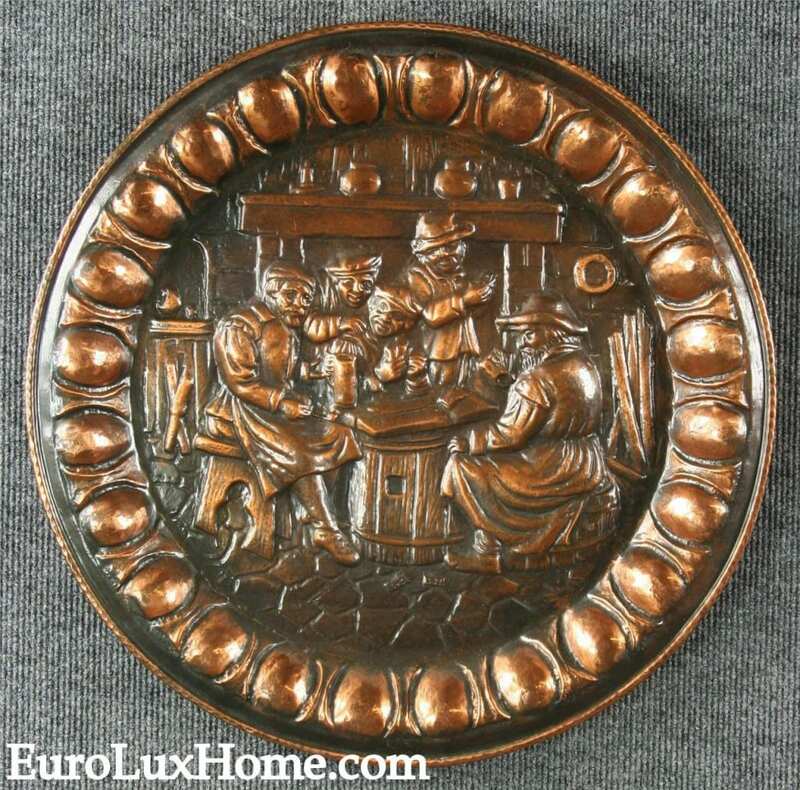 This large vintage copper wall plate actually hails from Belgium. The Flemish plate shows a group of merry villagers quaffing ale around a pub table, and it would look great hanging on a kitchen or dining room wall. The burnished tones of the plate add to the appeal. Copper is often used in the kitchen of course. As I said in my blog post on Downton Abbey Kitchen Style, the warm glow and sturdiness of copper creates a unique sense of tradition and comfort. Copper is a good fit for kitchenware as it also has antibacterial properties. Bacteria doesn’t last very long on copper! This photo shows a more unusual treatment of copper in the kitchen. It’s not just for pots and pans! 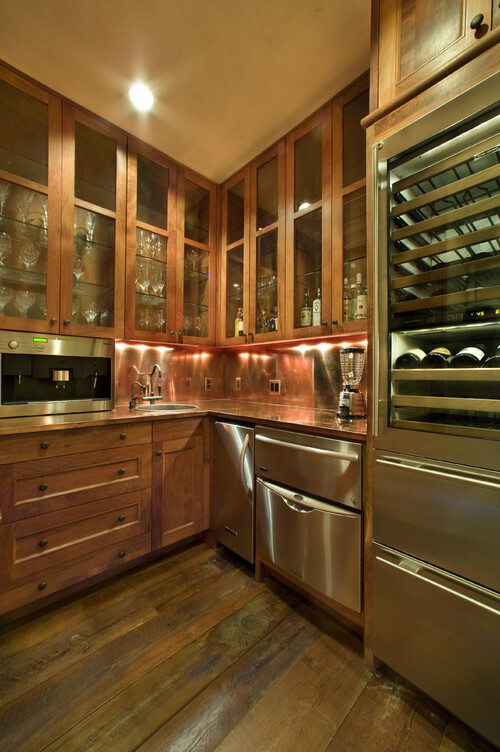 The copper backsplash looks fabulous against the stainless steel appliances and the reclaimed wood floor. Downlighting beneath the wall cabinets are the perfect choice to bring out the luxurious and inviting tones of the copper. The highly polished surface bounces the light and the photo proves that copper looks elegant in more modern settings too. Copper in contemporary decor usually looks best if you choose streamlined shapes. Here’s a way to see copper in a whole new light…. literally! The upcycled table lamp is hand-crafted to order and made with a pierced shade and recycled clear or blue glass insulators from old telephone poles. The light shines through the pierced shade to create a delightful ambience in your office or study. Hammered copper always looks so earthy yet so exotic. The sensuous hammered finish is a superb match for the rich burnt tones of the copper, as you can see in this new Ambella Home sink chest from the Rustico collection. 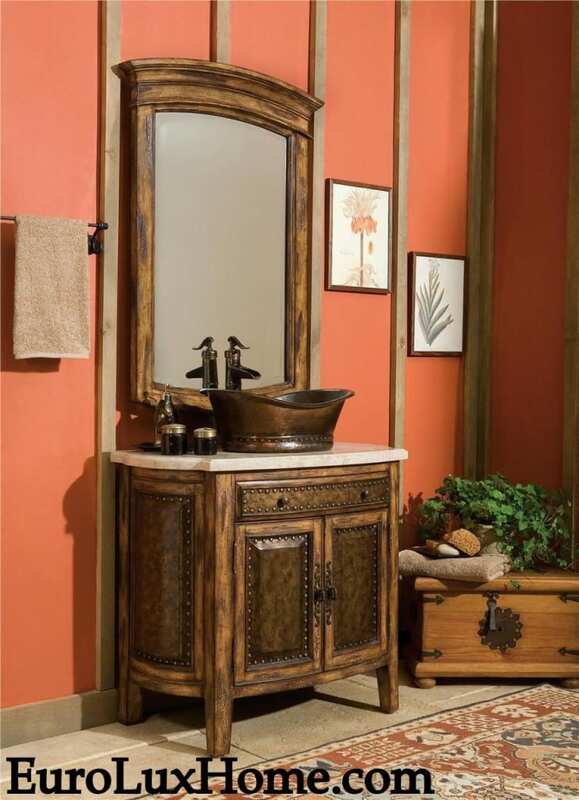 The hammered copper vessel sink stands out on the antiqued Travertine counter to evoke a romantic mood of yesteryear. Do you have copper accents in your home decor? Where and how do you use copper? We’d love to hear about it. Aimee owns EuroLuxAntiques.com with her husband and best friend, Greg. Aimee sources amazing antique furniture, vintage lighting, & high-quality reproduction furniture to help her customers decorate their homes in a unique way. She loves her 8 (you read that right) fuzzy children and is renovating a 1920s bungalow in South Carolina. Find us on Facebook or connect with Aimee on Google+ Or you can sign up here to receive this blog in your inbox. 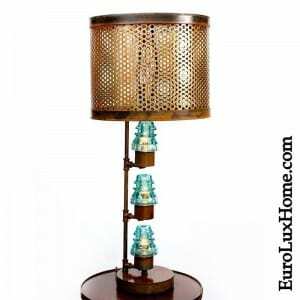 This entry was posted in Home Design Ideas and tagged Ambella Home, copper, creative home decorating, home decor, home decor accessories, home decorating trends, interior decor, kitchen, upcycled on August 24, 2014 by admin. In our February blog posts we took a peek inside some of our clients’ homes and explored antique furniture and chic home accents. This shortest month of the year has just zoomed by, but we’ve made the most of every day. We hope you have too! Let’s revisit some of our favorite February posts. We started the month enjoying tea in our client Barbara’s kitchen. Well, we didn’t literally go to visit her in Cambridge, MA, but when we saw the photos of her kitchen we certainly wanted to! 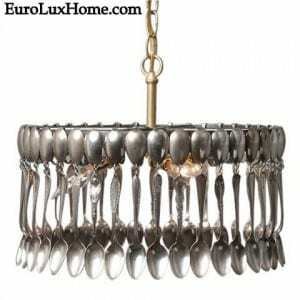 Barbara has this beautiful teacup and spoon chandelier hanging over her Farmhouse style sink. The chandelier is just one of many hand-made upcycled light fixtures in our gallery, and they all make unique home accents. This one is crafted by an artisan using vintage silver plate spoons. It blends perfectly with the other classic elements in Barbara’s decor. You can see more photos of her lovely kitchen in our client spotlight on the vintage spoon chandelier. From the kitchen to the dining room! Our client Tracy bought this oak Renaissance buffet dating to 1900 from us and shared how it looks in his home. 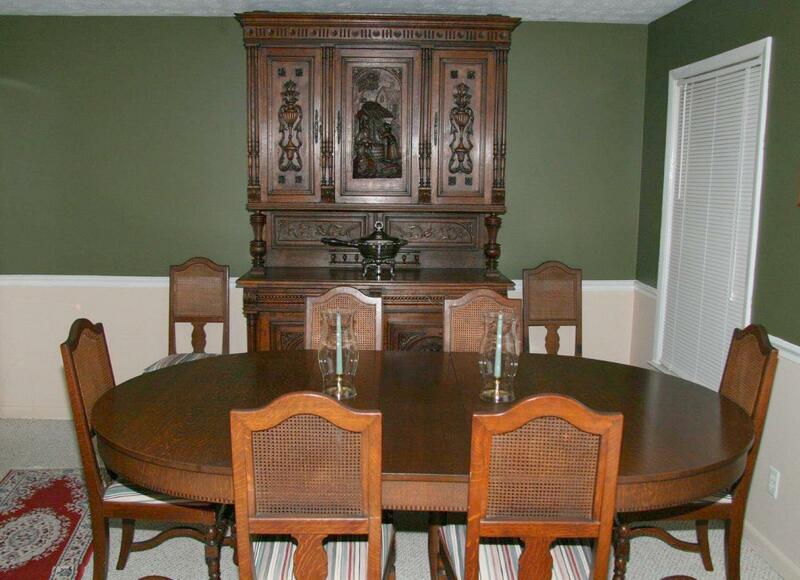 The finely carved buffet looks wonderful against his sophisticated dark green walls. That post also gave me the chance to tell you more about the background and typical features of classic Renaissance style. See more photos and learn about antique Renaissance style furniture. Greg and I celebrate 10 years of EuroLux Antiques in 2014. 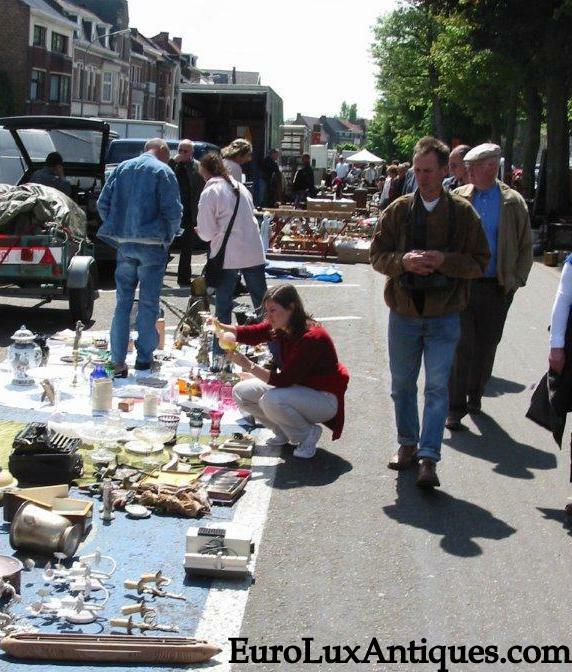 Here I am scouting for antique furniture and home accents on our first European buying trip. We had just quit our corporate jobs and put our life savings into following our dream. We believed that regular folks like us would love hand-selected, high-quality European antique furniture as much as we did. We also had faith that they would buy it online, especially as we could offer very competitive prices compared to fancy big city galleries. We had no idea of what was ahead of us! It has been an amazing journey and you can read about our first steps in my post on 10 Years of European Antique Furniture. While most of our furniture and home accents are antique, we also choose some finely crafted, high-quality reproduction pieces to offer to our customers. This stunning Woodbridge coffee table from the Madeleine collection is a great example. The antiqued gold leaf finish and glass top looks perfect in our client Mary’s chic living room. 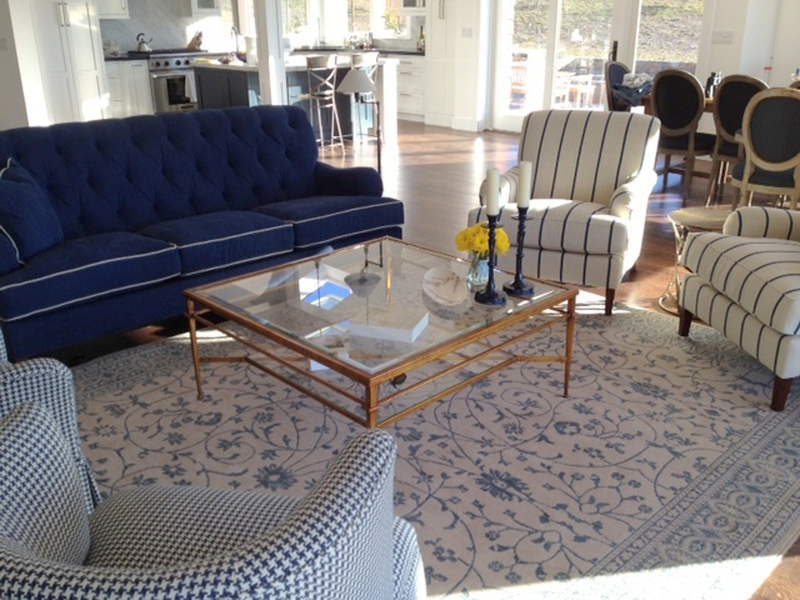 See more of Mary’s sunny California home in our Woodbridge coffee table post. 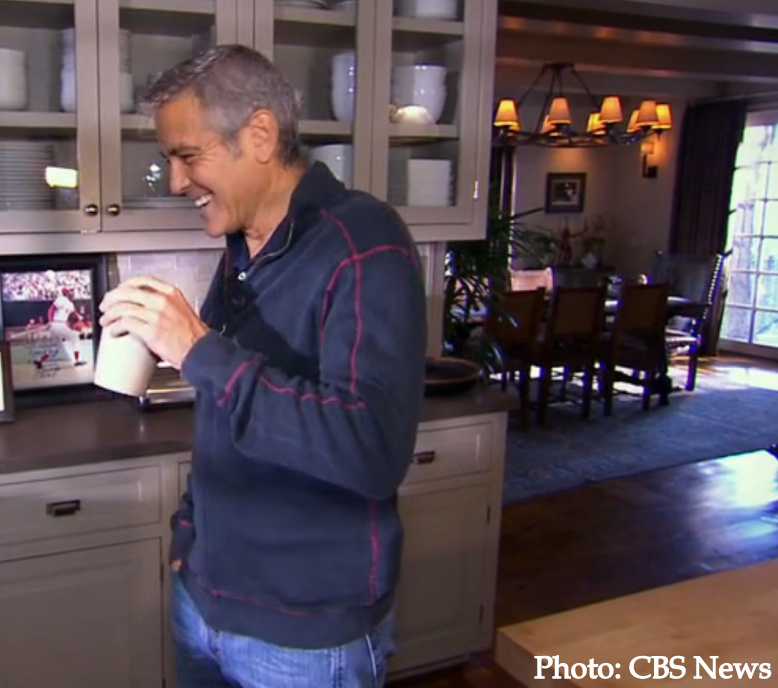 Just in time for the Oscars – are you ready for your close-up, Mr. Clooney? In our blog post on celebrity antiques lovers, we had fun talking about the Academy Awards stars who love antique furnishings in their decor just as much as the rest of us. We found that George Clooney, Sandra Bullock, and Ellen DeGeneres have more in common than just great talent. Clooney, for example, seems keen on antique Mission style lighting, as he has decorated the dining rooms in two of his homes with them. I’ll be back in March to talk more about antique furniture and home accents. Till then, I’m stocking up on popcorn for Oscar night! This entry was posted in Antique Furniture, News and tagged Antique Furniture, antique Renaissance buffet, design inspiration, European Antique Furniture, European Antiques, home decor, home decor accessories, upcycled, Vintage Chandeliers, Vintage Lighting, Woodbridge Furniture Company on February 27, 2014 by admin. 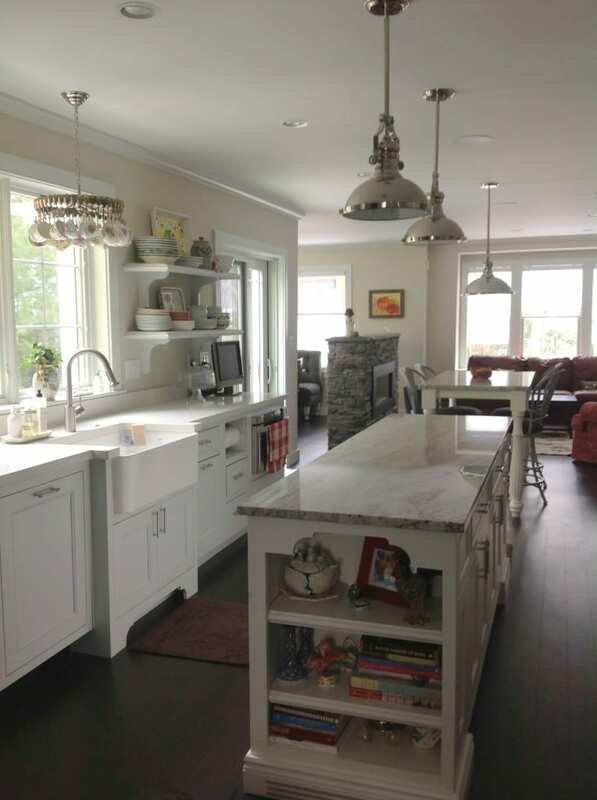 Barbara E. in Cambridge, MA, sent us some wonderful photos of her kitchen with the charming teacup and spoon chandelier that she ordered from us. Barbara said: “I love the chandelier and get many, many compliments on it.” Let’s take a look and see why the custom-made spoon chandelier is so popular in Barbara’s kitchen! This is the silver spoon chandelier that we offer in the gallery. It is hand-crafted for us by an artisan who uses vintage silver plate spoons for his amazing creation. The spoons are bent into handles – so in fact you can hang any collectibles you want from it. Teacups look exceptionally pretty. 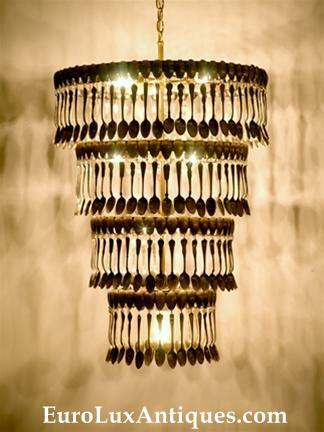 Because each spoon chandelier is made-to-order, no two are exactly alike. And if you wish, you can also customize it, which is exactly what Barbara did! Here is the teacup and spoon chandelier hanging in Barbara’s kitchen. Barbara ordered the chandelier to be modified so it only has one tier of spoons rather than two.The unusual design creates a nice cozy vintage mood, and I bet it’s a conversation-starter when guests visit. This bigger view shows how the teacup and spoon chandelier works so beautifully in Barbara’s kitchen. Someone with a less keen eye than Barbara might worry that the old-fashioned style of the spoon chandelier would clash with the more modern light fixtures. But in fact it all lives very happily together, perhaps because the silver plate spoons blend nicely with the other silver-tone lights. Barbara is obviously one of our many design-wise customers who are confident enough to mix eclectic decor elements and create their own unique style – a smashing success in my book! It all looks just as gorgeous in the daytime. What an inviting space, opening out into the living area. I love the marble top counter and especially the vintage feel of the farmhouse sink and open shelves stacked with bowls. I hope that the teacup and spoon chandelier gives Barbara a smile as she works over the sink. It certainly inspires the cheerful feeling that any time is tea time! The custom-made chandelier is part of the whole upcycling trend where artisans take vintage objects and refashion them into something new and beautiful. We have many different upcycled light fixtures in the gallery for you to browse. I’ve also posted before on this blog about upcycled decor – like this client spotlight on an upcycled chandelier we provided to a restaurant, created out of a whole vintage tea service. We’re fans of upcycling because it combines craftsmanship and originality and gives new life to objects that might otherwise be discarded. It also creates a sense of authenticity in home decor. So thanks Barbara for sharing your photos of how you display your teacup and spoon chandelier in your lovely kitchen. I know we all want to come round for a cup of tea later! 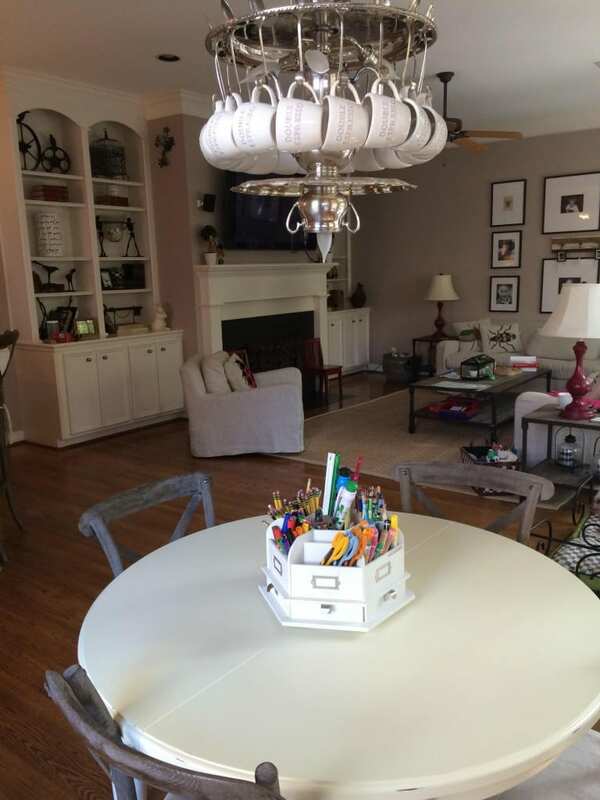 This entry was posted in Client Spotlight, Vintage Lighting & Chandeliers and tagged chandeliers, kitchen, lighting, repurpose, repurposing, spoondelier, tea service, upcycle, upcycled, Vintage Chandeliers, Vintage Lighting on February 3, 2014 by admin. We’ve been looking at decorative stair ideas that give you the chance to express your creativity in this most humble and functional area of the home. Although our 1920s bungalow renovation is still in progress, I’m getting a lot of inspiration for my own decorative stairs! One of them might work for our upstairs area dedicated to Greg’s ‘man loft’ and the guest bedroom. Graphic and gorgeous! Music fans will enjoy these elegantly decorative stairs, painted with piano keys. This would be a fantastic way to lead visitors up to your music room. Don’t neglect the stair risers! These decorative stairs feature a selection of pretty floral wallpapers on the risers. 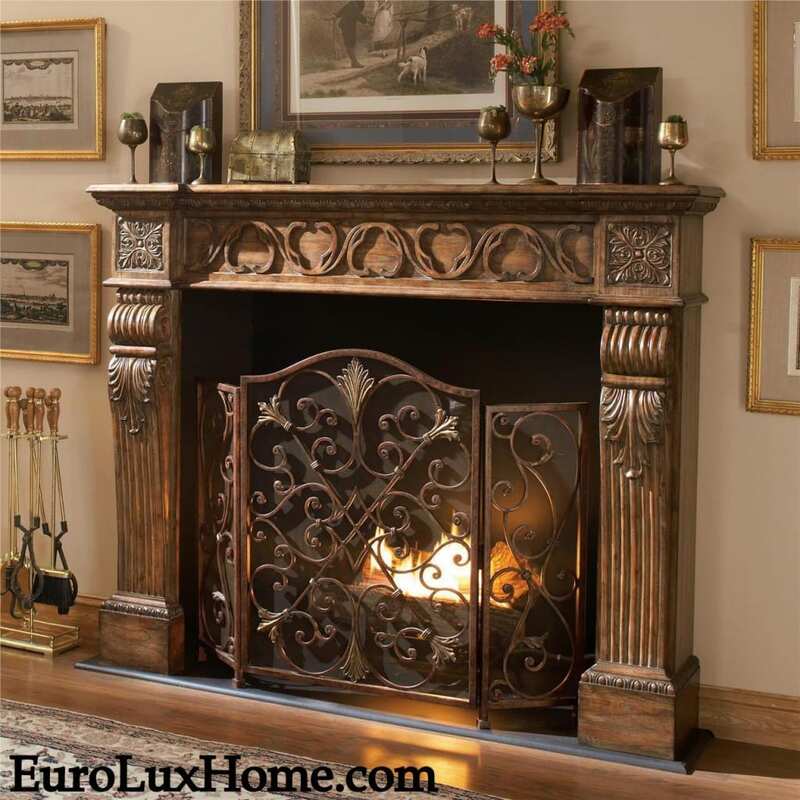 It’s a great idea for a country cottage or to enhance a Victorian decor home. You could of course use all the same wallpaper on each riser. But I rather like the unmatched and eclectic feel of this approach. It adds to the vintage mood. Here’s a fine way to upcycle some old wooden rulers. You have to look quite closely to see that they are indeed old-fashioned rulers glued to the stair risers. The various tones of the wood and the styles of the ruler markings create a unique effect. Tile on the stair risers might be a more tricky DIY job. You need to ensure the tiles are exactly the same height as the risers. But look how fresh and appealing the tile looks! I can picture this working beautifully in a coastal home, with the breezy blue and white tile, accented by one red riser. It could also be rather fabulous with Art Nouveau design tile. This clever home-owner has used decals on the risers to create a butterfly and bird vignette. The surrounding walls and stair rail are kept quite simple and clean. I think this is generally a good idea so the decorative stair design is framed without too much other distraction. If you want a simpler but still very decorative stair approach, the subtle gradation of color on these stair risers looks highly sophisticated. It’s a rainbow of blue! Turning our gaze to the other side of the stairs, shelves on the underside of an open staircase are a great way to display your books, collectibles, and small antique or vintage items. If you have any decorative stair techniques or ideas, we’d love to hear about them. Tell us in the comments box below! Aimee owns EuroLuxAntiques.com with her husband, Greg. Aimee sources amazing antique furniture, vintage lighting, & high-quality reproduction furniture to help her customers decorate their homes in a unique way. She loves her 8 (you read that right) fuzzy children and is renovating a 1920s bungalow in South Carolina. Connect with Aimee on Google+ or you can sign up here to receive this blog in your inbox! This entry was posted in Home Design Ideas and tagged blue, home decor, interior decor, interior design, staircase, stairs, upcycled, Victorian, vintage on September 5, 2013 by admin.